The new Audi A3 saloon, which goes on sale in the UK this week, will be available with three engines, two trim levels and two gearboxes from launch. Entry level price is £24,305 for the 1.4-litre TFSI model in Sport trim rising to £28,105 for the 1.8-litre TFSI in S Line form. Buyers can expect delivery of the A3 saloon from September onwards. Based on the same underpinnings as the A3 Hatch and Sportback, Audi's new four-door saloon will get a longer, taller body and offer 425 litres of storage space. The new A3 will represent a strong alternative to the Mercedes-Benz CLA, but could also lure in traditional A4 buyers with its short overhangs and sharp lines presenting a compelling case for the compact, executive saloon. 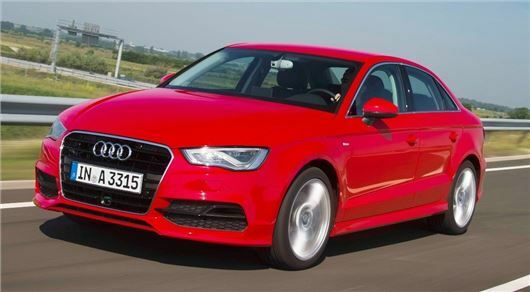 The A3 saloon will be initially offered with a choice of three engines - two petrol units and one TDI. At the bottom end of the range at £24,305 will be the 1.4-litre TFSI petrol, which will combine 140PS with a combined 60mpg. The 1.4 will also feature Audi’s Cylinder-on-Demand technology, which can deactivate half of its cylinders to save fuel when on motorways. Higher up the range at £25,955 is the 1.8-litre TFSI, which will offer 180PS and return 50.4mpg. There will also be a diesel unit available in the form of a 2.0-litre TDI engine. Priced from £24,275, the oil burner will return up to 68.9mpg and offer a more than respectable 150PS and 320Nm of torque. Both of the petrol engines will be available with the choice of a six-speed manual or S tronic dual-clutch gearbox, while the 2.0-litre TDI will initially only be available as a manual. Buyers will have two trim levels to choose from – Sport and S Line – with the later attracting a £2150 premium for 18-inch alloy wheels, xenon headlights and part-leather leather upholstery.